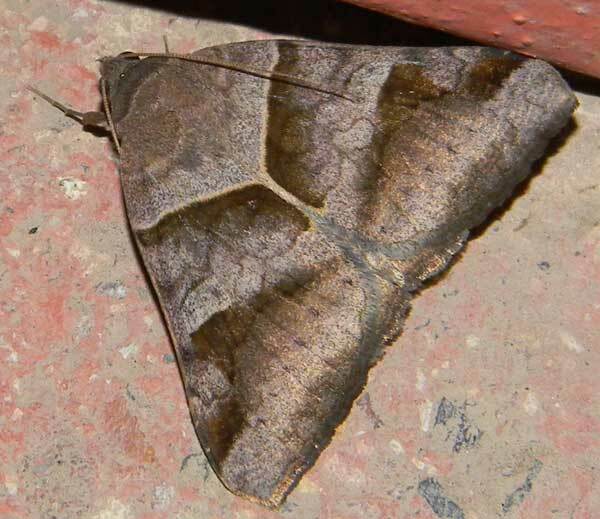 Observed at Eldoret, Kenya, Africa. October 2010. Elevation 2000 meters. It was alighted beneath an electric light. The wing patterns of many moths are designed to camouflage the insect during the day as it rests on a tree trunk or other object. The precise species of tree or lichen etc. is highly correlated with the moth's pattern. Each species of moth has a particular pattern and matching behavior that makes it difficult for birds, reptiles and mammals to see and predate them. How the moths pick an appropriate landing spot is amazing given that their own eyesite is not very good! Some underwing moths have the second pair of wings brightly colored; when these usually concealed wings are suddenly exposed they can startle a predator just long enough for the moth to make an escape. 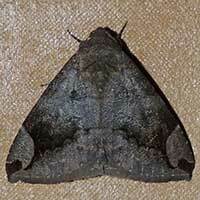 In this species the underwings are a solid dark color, which probably do not have the same effect.